CLAMPING FORCE Clamping force is constant due to center ram construction. 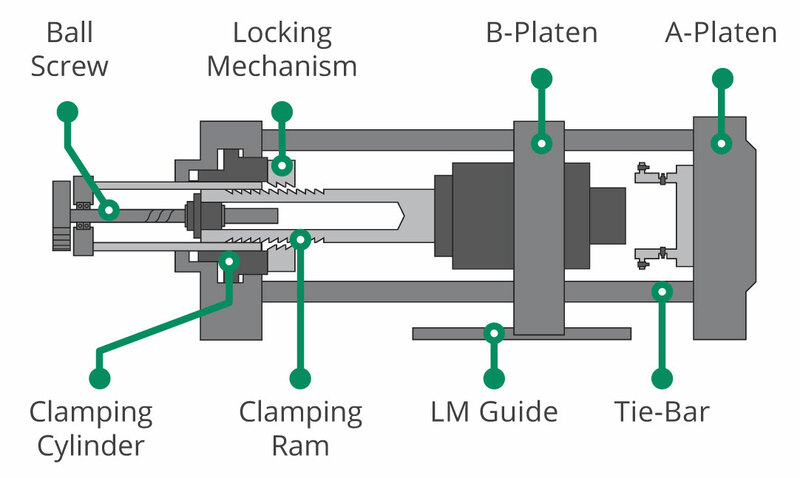 Direct pressure clamping is from short stroke "pancake" cylinder. Adjustment of clamping tonnage is easy and even throughout the cycle. Clamping force may not remain constant due to increased temperature. This increased temperature expands the mold and length of tie bars. There is no simple positive indication of the actual clamping force. It is extremely difficult to use less than maximum tonnage or to adjust tonnage up and down during the cycle. STRAIGHTNESS & ALIGNMENT Mold open/close cylinder supported by a linear motion guide, which is provided for straight travel of the movable platen and accurate alignment with the fixed platen. Movable platen cannot move completely straight due to tolerance of arm dimensions and worn links. PRESSURE DISTRIBUTION Direct clamping pressure by central ram construction provides even distribution on platen. No misalignment of mold. There is potential for platen deflection because toggles push the corners of the platen instead of the center of the platen. MAINTENANCE Hydraulic short stroke "pancake" cylinder uses only a small amount of oil, which is designed to reduce/eliminate service. Hybrid clamping systems are a much cleaner system. Toggle systems need increased maintenance. They are comparatively more susceptible to wear and require grease for maintenance, which may bring contamination issues.